There’s a great story reported by RollingStone.com that says the London Olympic Committee has approached Keith Moon’s agent to see if the drummer would like to take part in the summer’s festivities? It is of course refreshing that the Olympic Committee is not being ageist, and is prepared to overlook Moon’s past bad behaviour at parties. In the seventies this included driving his car into a hotel swimming pool. They have clearly been swayed by the fact that Moon has cleaned up his act considerably in the last 34 years, with his indiscretions being relatively few, what with his being dead and everything. There is no truth in the rumour that the same committee have approached the representatives of Jimi Hendrix, John Entwhistle and Jerry Garcia to ask them to reform The Grateful Dead…. 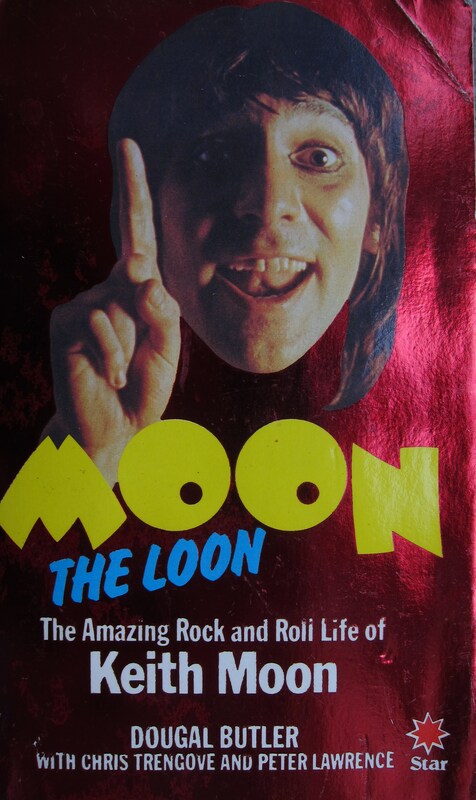 The other is Moon the Loon. Now out of print, this paperback was written by Moon’s personal assistant Dougal Butler, published in 1981 and gives a very funny account of the great man. Read them in tandem, and there’s a fun and potentially factually accurate account of the great man. I guess it depends upon whom they are aiming their javelins at….? Never have I seen anyone else attack a drum kid like Keith Moon – whirling flailing maniacal vortex of absolutely perfect music. That is pretty much exactly how the book ends! I can see why the teachers might have objected to your use of that quote in your exam…. That is hilarious. Since Moon won’t be available, I think they ought to ask John Bonham instead. I hate to ask how old the Olympics Committee members are. It almost sounds like they wanted to hire “that far-out drummer bloke” they’d heard about in 1964 without checking on him since then. Thanks for the tip about the books; I’ve wondered if there was a definitive bio out there. Isn’t there also one called “Full Moon”? Haven’t come across that one unless you mean the PG Wodehouse book, which is quite light on drunken drummers in rock bands.